We all live in multiple on-line communities. What do these communities look like? Where are we located in each of our communities, and what role do we play? The diagram below shows an actual on-line community [OLC]. Every node in the network represents a person. A link between two nodes reveals a relationship or connection between two people in the community -- the social network. Most on-line communities consist of three social rings -- a densely connected core in the center, loosely connected fragments in the second ring, and an outer ring of disconnected nodes, commonly known as lurkers. Communities have various levels of belonging -- each represented by one of these rings. You may belong in the core of one community, while being a peripheral lurker in another. In the above diagram, we see three distinct types of membership in our community -- designated by blue, green and red nodes. We have seen these three rings in all on-line communities we have examined. The proportion of nodes in each ring in this population is fairly typical of most on-line communities -- the isolates [lurkers] outnumber the highly-connected by a large ratio. The outer orbit in the network above contains the blue nodes. They have been attracted to the OLC, but have not connected yet. The blue nodes contain both brand new members, who have not connected yet, and passive members who have seen no reason to connect. The passive group is the most likely to leave the OLC, or remain as absorbers-only of the content in the community. Lurkers in online communities are often more than 2/3 of the group! The green nodes have a few connections -- usually with prior acquaintances. They are not connected to the larger community -- only to a small, local group. They do not feel a sense of true membership in the larger whole, though they may identify with it. The small clusters of friendships amongst the greens can be maintained by other media and do not need this particular OLC to survive. They are also likely to leave or become passive and will likely do so in unison with the rest of their small circle of friends. 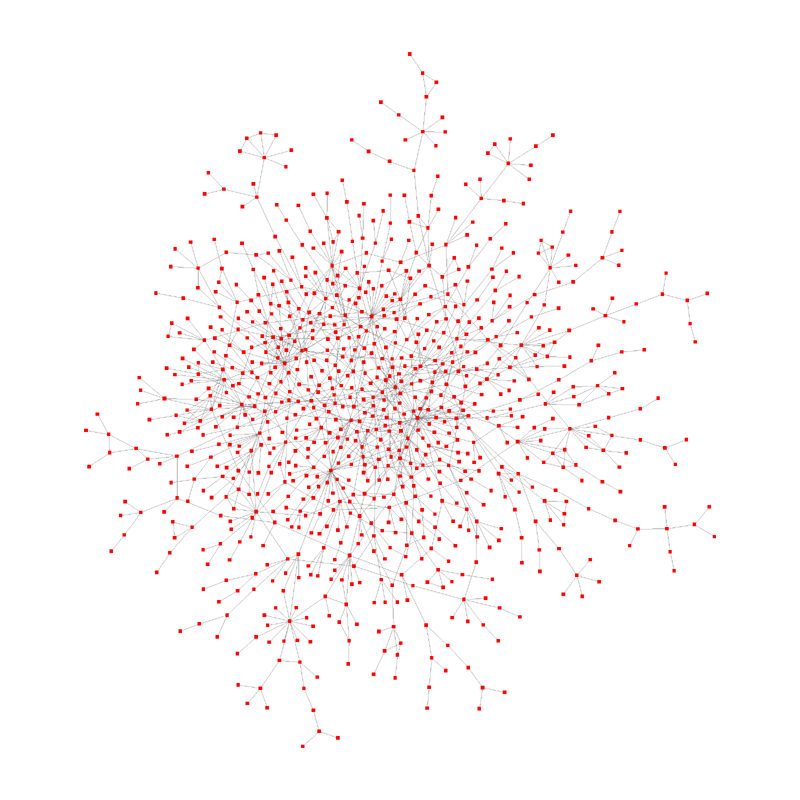 The inner core of the community is composed of red nodes [zoomed-in view below]. They are very involved in the community, and have formed a connected cluster of multiple overlapping ego networks. The leaders of the OLC are embedded in this core cluster. The core members will stay and build the community. Unfortunately they are in the minority. The core node consists of usually less than 10% of most on-line groups -- sometimes they are as few as 1% of the total OLC. Although small, they are a powerful force of attraction. It is the core that is committed and loyal to the OLC and will work on making it a success. They see a win-win for themselves and the group -- better connectivity will help the individual and the group simultaneously. Online communities and social networks are often conceived and developed by businesses and organizations that focus on: "How can we use the online community to benefit us?" Focusing only on how to utilize the community, leads many organization to failure in building these communities! They fail at community development by not creating a strategy that makes sure their target audience is gaining a positive experience and practical benefits from participating in the community. It is amazing how many organizations try to build on-line social networks while ignoring the needs of the very people they are trying to attract and influence! It is then no surprise when large chunks of their target group leave when the "next big thing" comes around: SixDegrees-->Friendster-->Orkut-->MySpace-->Facebook-->Next? To build a vibrant and growing OLC, you need to support natural human behavior, not work against it. You need to think sociology, not just technology! Connections are key in on-line social networks -- people are loyal to what they are connected to and what provides them benefits. People stick with established ties they trust. Interacting with those we know and trust brings a sense of warmth and belonging to the virtual communities we visit via our computer screens. Yet, we are open to meeting new people -- as long as they introduced by those we trust. An established community, with dense interconnectivity, not only keeps existing members happy, but is also a large magnet for contacts of current members -- everyone wants to be connected and included in thriving communities that provide benefits to all members -- old and new. The red core provides several advantages to the community builder and the network weaver. The field of social network analysis [SNA] gives us tools to both know the net and knit the net. 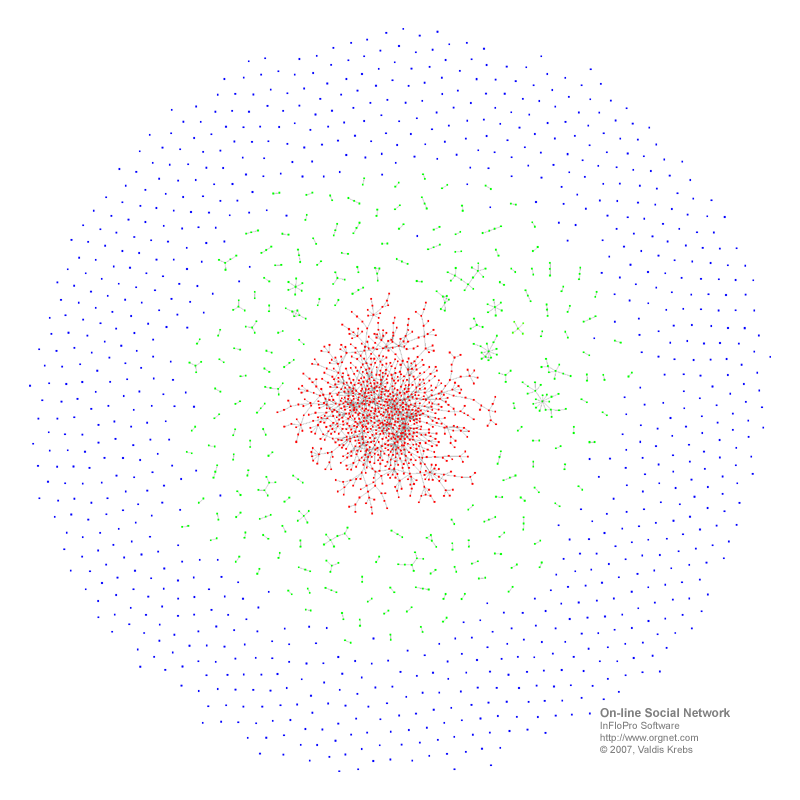 SNA maps and measures the paths of information, ideas and influence in the community. SNA reveals the emergent patterns of interaction in organizations and communities and allows us to track their changes over time. Social network analysts do not focus solely on attributes of individuals. They look at relations and exchanges between people and how these connections influence choices. They examine the affect social networks have on the behavior of individuals -- how people influence social structures, and in return, how those structures affect the individuals embedded in them. Growing a community is not just adding new members. It requires adding both people and relationships -- nodes and links. Node counts are important in social networks, but it's the relationships -- and the patterns they create -- that are key! A community thrives by its connections, not by its collections! It's the relationships, and the prospect of future relationships, that keep members active and excited. Before we find success in Web 2.0 we must throughly UNlearn two memes from Web 1.0. It's not "more eyeballs" --> It's the context, stupid! Content is not King --> Community is King!